It was a cold grey day in late November. The weather had changed overnight, when a backing wind brought a granite sky and a drizzling rain with it, and although it was now only a little after two o'clock in the afternoon the pallor of a winter evening seemed to have closed up on the hills, cloaking them in mist. It would be dark by four. I will admit to having had a very decisive view on the quality of Daphne Du Maurier books before I had even read a page. I had classified her up there with Catherine Cookson and had vowed never to read one of her books. I now realise I was being a real ignoramus. Daphne Du Maurier is a legend and I intend to devour every book she has ever written. From the first chapter of this book, I was completely immersed. Daphne's style of writing just draws you in, with her descriptive passages. The book is set in Cornwall and has the air of a thrilling gothic drama to it. I insist that all who read this, set the scene first, by saving it for a dark and stormy night, just to add your own personal sound effects. I refused to read it during daylight hours, as it is a book that needs darkness to be read to it's full effect. The story begins with Mary on a sad and desperate journey to her aunt's home after the death of her mother. Before arriving, she is forewarned about the reputation of her new home, Jamaica Inn. Mary arrives with trepidation,to a dark and forbidding inn, standing lonely on the moors, only to be greeted by her evil uncle, whose reputation travels before him. Mary is shocked to find her aunt so different from the frivolus and carefree one she remembered. Her aunt has been overpowered by her brooding husband and Mary vows to take care of her. The inn is a dark place to live in, with lots of evil seeping out through the walls. Mary is so disgusted by the antics of her uncle and his shady colleagues, that she makes plans to get her uncle arrested to pay for his crimes. Mary is a very strong female character. She is not afraid to stand up to her uncle and his friends. She risks her own life in order to seek justice. Her only stumbling block is the brooding younger brother of her uncle. Whilst looking at Jem, she realises how her aunt fell into such a disastrous marriage , as Jem is an exact replica of his brother and she can feel herself falling in love. The book shows how strong Mary is as she battles relentlessly against her uncle. He finds her attractive and interesting as she does not bow down to his demands. In return, Mary is repulsed by her uncle and fights to keep him at a distance. I just loved this book. I could not put it down. To me, each paragraph seemed to be so finely tuned. As you read the book, you find the writing just flows. I felt that this book really stands the test of time and could have been written in our present era. I loved comparing Joss Merlyn, Mary's uncle with his younger brother Jem. Jem is exactly like his brother used to be and with his roguish charm, you can easily see why Mary's aunt was so easily led. This book is full of darkness, disaster, destruction and death, definitely a book I would read again. A friend of mine, who has urged me to read Daphne Du Maurier for the last two years, was overjoyed at defeating my hostility and has now lent me Rebecca to read. As I understand, Rebecca is by far the best book Daphne Du Maurier ever written, so I shall soon be diving in. 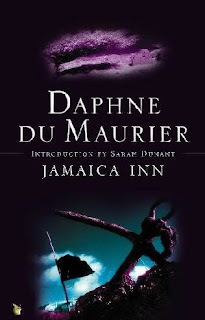 I know quite a few of you have Jamaica Inn on your list of possible books for the RIP challenge and I would highly recommend that you read it. I've read Rebecca though it was a long time ago but nothing else by this author - you have just inspired me to do so, what a wonderful post, you could tell you had really enjoyed the book. If you haven't read Rebecca, I would strongly recommend that you do. The gothic feel to that novel is tremendous. Sandy at You've Gotta read this is having a read along for Rebecca starting tomorrow. She has a schedule to start discusion of the book on Oct 8th. You might like to join in. I'd be thrilled to see you there. I thought du Maurier wrote frilly romance stories until recently too. I haven't read any of her work yet, but really do want to read Rebecca. Is this the first book by her you've read? I haven't read any yet (plan to read Rebecca for RIP). We own this one, but heard it's not her best. Sounds like it was good, though. I've been wanting to read this one. Actually, I've been wanting to read all of her novels. She's a great writer! I love Rebecca and hope you enjoy it too. A great pick for the R.I.P. challenge! I've also read Frenchman's Creek which is such a good historical romantic one. You crack me up...and I have to admit I find myself being an ignoramus quite frequently. :D I can't believe I've yet to read one of her novels. She is hands down my all-time favorite writer of short stories, so I've no doubt I'll adore her books as well. Hi, I want to read this, (even more now I've read your review) and re-read Rebecca, too. OMG, I can't believe that I missed this one—back in the day, when I was obsessed with Du Maurier. Of course, Rebecca was a favorite, as was My Cousin Rachel. But this one sound very eerie and appropriately spooky. Great review, Vivienne! I am looking forward to reading this book. I’ve read Frenchman’s Creek by Daphne du Maurier and I have recently bought Rebecca! Oh this book sounds excellent - great review! I'm so glad u enjoyed this book. It has been on my shelf for a while now. Thanks for the great review. Thank you for a great review! I've only read Rebecca and it's brilliant. I never thought of reading another by this author but this one sounds great too! There is a group reading of Rebecca mid to late October if you're interested. wow, glad you found a new fav author. this one sounds good. a book that needs to be read on a dark and stormy night is a good thing! Isn't it funny how we get preconceptions about an author? My view about her was that she would be 'to intelligent' for me to understand or to read. I don't know why I thought that but I did. Then I read a review a few years ago where someone described her as a gothic/macabre author, that was it - I was sold, I found Rebecca in a charity shop and got it... it's now one of my favourite books. Love it. The b&w movie of the book is great too and not totally different from the book as you sometimes find. Just saw Kayes post about the read along - if you haven't already got a copy of Rebecca let me know. I have a spare. Oh my gosh, this post makes me want to run out and buy this right now! (I'm not kidding). Rebecca is amazing; this one looks just as good! I haven't read any Daphne du Maurier books either - I had the same reaction you did, at least until everyone started telling me how wonderful Rebecca is. I'm hoping to read it at some point in the next year. Thanks! You just gave us our 2nd gothic theme title. You know, even though I've read Rebecca. I still thought of her other books as kind of trashy romance novels that are read by old women. I think I, too will have to give her another chance. Maybe I'll read this one, it sounds really good. So glad you discovered DuMaurier! Rebecca is wonderful. I got to read My Cousin Rachel earlier this year and really enjoyed it a lot. I don't know why I haven't read more by her but I'd love to read more, especially her short stories. They sound very gothicy and macabre! Rebecca was the first gothic novel I read, and I am completely in love with that book. I've been looking for other Du Maurier novels to start; this one sounds interesting. It's been awhile since I read Rebecca and I plan on re-reading it eventually but I may pick this up first. Oh man! Your review is fantastic and really makes me wish that I had this one on the shelf. I do have Rebecca, though, and plan to read it later this month. Really looking forward to her writing now! Sounds like an entertaining read. I've heard good things about Du Maurier but haven't ever read anything. I'll have to give her a try.